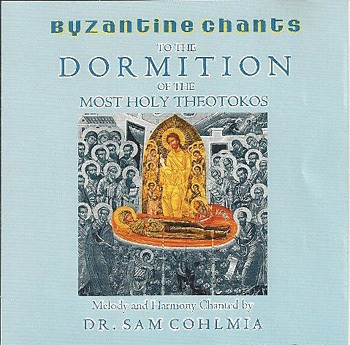 In the meantime, Dr. Sam Cohlmia, protopsaltis of the Antiochian Diocese of Wichita and the Midwest as well as St. George Cathedral in Wichita, was kind enough to send me a review copy of his new recording, Byzantine Chants to the Dormition of the Most Holy Theotokos. It contains many of the festal hymns for the Feast of the Dormition, with Dr. Cohlmia as solo cantor throughout (and providing his own isokratima via the miracle of modern recording technology). The disc is fairly evenly split between English and Arabic, with Dr. Cohlmia using the Holy Transfiguration Monastery Menaion for most (not quite all) of the metered hymns (prosomoia), and Nassar (apparently modified in spots) for the non-metered hymns as well as the stichera at the Praises. In terms of musical sources, Dr. Cohlmia is using Arabic scores by composers such as Mitri El Murr and Andraos Mouaikel, and adapting those into English himself. The melodies for the Lamentations are a bit of a puzzlement to me — not necessarily on this disc, but in general — since what’s sung here represents the third set of permutations that I have been told are the “authentic” Antiochian melodies, so I’m not sure what that means. There is a great deal to like on this disc; Dr. Cohlmia has a clear and lovely voice, and handles the vocal requirements of both languages nicely. Although Lebanese-born, his sung English diction is excellent, and all the texts sound smooth and natural throughout. He is able to bring a good sense of style to the presentation; while his approach as a solo cantor makes for a different realization of “Antiochian style” than one hears on, say, The Voice of the Lord (which represents the chant tradition of the Patriarchate of Antioch applied to an English-language choral context), the two recordings clearly share and are honoring the same heritage. That said, some of the differences in approach are evident in spots where the recordings are using the same melody — for example, in the Kathismata for both feasts, the nenano melody “Κατεπλάγη Ἰωσήφ” (“Joseph was amazed” in the HTM books) is employed, and the contrast between the choral and solo realizations is subtle, but interesting. One thing that both recordings do that’s particularly nice for learning purposes is proper use of metered model hymns. This is a system that can be a bit opaque for cantors who are having to cut their teeth in the Antiochian Archdiocese; neither Kazan nor Nassar make note of their use, Nassar is unmetered anyway, and Kazan just writes them out and shoehorns the texts into them without telling the singer that that’s what’s happening. For metered translations one must turn to the Holy Transfiguration Monastery books, which seems to have something of a “Don’t Ask, Don’t Tell” status in the Antiochian Archdiocese, and which also aren’t complete outside of the Menaion. A metered Octoechos doesn’t appear to exist, neither does a metered Triodion, and the Pentecostarion has been being revised and “due any day now” for several years. Even if you have metered texts, however, sources for the melodies are tricky. HTM’s book of melodies is a bit idiosyncratic in terms of musical material, and while Fr. Seraphim Dedes’ is better in terms of being better-grounded in “classical” sources (like the Irmologion of John the Protopsaltis), it’s harder to use with the HTM books because the melody titles are different — sometimes marginally so, sometimes significantly so — and the translations are idiosyncratic. It’s better, frankly, to just learn Byzantine notation and learn the model melodies out of the Irmologion, but then there’s the problem of not getting the sung tradition in addition to the notated tradition. There’s this site, and the recordings are instructive, but not exactly stellar. All of this is to say, Dr. Cohlmia’s recording, as with the Theophany School disc, provides an English-language model for realizing a nice little handful of the model melodies realized with metered translations, and that makes it useful as well as enjoyable and prayerful to listen to. I’m not clear as to why he doesn’t use the metered translation for the stichera at the Praises, and the model melody is quite a bit different from the one that’s in the Greek books (“Ὡς γενναῖον ἐν μάρτυσιν”, “As one valiant”), but the others employed are wonderfully practical learning tools. Anyway, I’d love to get Dr. Cohlmia and Rassem El Massih in the same church at some point for a Liturgy, and perhaps I will. The CD can be purchased through the Wichita Chancery (details here). I also present Dr. Cohlmia’s responses to some follow-up questions that he was good enough to take the time to answer. I find them very illuminating, and I appreciate the perspective he brings to the table. I will be curious to hear what others think. 1) How were you trained as a cantor? I self-trained beginning in 1991 out of interest. Being born in Beirut and going to church there and being exposed to excellent chanting, it was relatively easy for me to understand the melodies, since several of them are derived from the 11 basic Oriental melodies, such as Hijaz (Tone 6), Nahawand (Tone 5), Bayyat (Tone 1), and so on. I was not formally trained to become a chanter, but simply practiced constantly. 2) For this recording, did you sing off of notated scores, or did you just have texts that you knew how to sing from memory? If notated scores, did you use staff notation or Byzantine notation? I wrote the music for the entire Orthros service of the feast of the Dormition (in Western notations). For some of those pieces of music, I simply transcribed the Byzantine notations from Mitri Murr’s arrangements in Arabic to Western notations in English. 3) How do you approach chanting in English differently from how you approach chanting in Arabic or Greek? Chanting in English is rather tricky when compared to doing the same in Arabic or Greek. In English, you have to be extremely careful with the pronunciation of the various syllables in addition to the lack of enough vowels makes chanting challenging. In Arabic, especially, there are lots of vowels, and generally it is easy to chant words without placing particular emphasis on specific syllables (that’s simply a general statement, of course). 4) Do you have a sense of how Byzantine chant in the Patriarchate of Antioch is distinct from, say, under the Church of Greece or the Ecumenical Patriarchate? How do you see how you chant as being different from how a Greek cantor might approach it, if at all? Overall, Arabic Byzantine chant in our patriarchate differs, in my opinion, than Greek Byzantine chant in the ecumenical patriarchate. To me, Arabic chanting is certainly more melodic and, horizontal (if you will) than Greek chanting, which at times sounds choppy. It simply flows better and sounds more soothing, although Greek chanting is very beautiful. My chanting style is certainly more based on the Arabic, as I use Mitri Murr’s and Fr. Nicholas Malek’s arrangements as a guideline. I do also have Protopsaltis Kharilaos Taliadoros’ anastasimatarion (in Greek), and it is beautiful, but not as melodic as the Arabic arragements. The arrangements of Mitri Murr, and Fr. Malek (new arrangements), truly bring the words to life, as the music is written to mirror the words. His work is very brilliant. 5) In week-to-week services at the Cathedral, what materials do you use? Are you using the chant books of Mitri El-Murr for Arabic, for example, or something else? What do you use for English? Kazan/Nassar? Or something else? I put together the Typikon Notes from the Arabic and Greek Typikon each week for the Sunday services. The text that I use is a combination of that from Nassar’s book as well as the HTM Menaion. At times, if the text does not exist, and it is called for in the Typikon, I simply translate it into English. So, we basically use the book of Nassar, HTM Menaion, HTM Pentecostarion, +Kallistos Ware’s Lenten Triodion, to name a few. For chanting purposes, we use the Byzantine music project put out by the Archdiocese (for English) and Mitri Murr’s work (for Arabic). Rarely would I use Taliadoros’ anastasimatarion (for Greek) unless there are Greek parishoners at Vespers or Orthros. 6) What’s your sense of how Kazan/Nassar have represented and transmitted Antiochian tradition for English-language Orthodox Christians? What could be better? What would you hate to see changed? Kazan’s music, like any other individual’s music, is one representation of Byzantine chant. It is certainly very simplistic, but good enough for the minimally trained or unfamiliar chanter. Most “chanters” in the US are not true chanters, but singers instead, so that music works fine for them. In my opinion, true chanters need to fully learn Byzantine music. As far as Nassar’s book, it is alright for the most part, although there are a few mis-interpretations, where the English could be better. The best work is HTM’s Menaion and Pentecostarion, since the interpretation in extremely accurate and the special melodies are perfectly metered. As far as what I would hate to see changed, I would hate to see the Church lose its Antiochian tradition. I would hate to see the music being watered down from the original humble Byzantine to the more dramatic and grandiose choral. Don’t get me wrong. The church needs the two, but there needs to be more emphasis on Byzantine chant, because it seems that it gets put on the back-burner at times. Furthermore, chanters need to learn Byzantine chanting and music, in addition to preserving some of the Arabic used in the church (depending on the individual church). 7) What’s the future of Byzantine chant in our Archdiocese, as you see it? Hopefully the same if not better. I would like to see emphasis on Byzantine chanting at the various seminaries (not just Holy Cross), as well as Byzantine courses being offered for ALL chanters. Any person who plans to approach the Psaltyrion to chant needs to have a good education on Byzantine chanting, which hopefully could be learned at some Byzantine school or course of some kind. I still don’t have an internet connection where I’m staying. It started going in and out a couple of weeks ago, and then last Monday (the 6th) it died entirely. My host spent about four days trying to get somebody on the phone to figure out what the problem was, and finally last Saturday (the 11th) a person came out to check the line. Turns out that the phone comapny put a splitter on the line, and did something that disabled the DSL connection when they did so. They are supposed to fix it, but it isn’t working yet. There appears to be some movement, because the light on the router that was blinking before, indicating the connection was totally toast, isn’t blinking anymore, but the light that needs to be on to indicate there’s a working connection hasn’t come back on. In the meantime, I can go spend money at an internet café, and I can also connect via the wireless connection at the Athens Centre, but in neither case do I really have enough time to either upload pictures or blog — I barely have enough time to catch up on e-mail. As soon as I have a regular, working connection again, I will have photos to post and plenty to chronicle for those following along at home. I’m sure nobody’s really losing sleep over whether or not I’ve posted something new, but I thought I’d let you know anyway. In the meantime, with a tip of the hat to RightWingProf, I think there is much worth chewing on in this piece written by Archimandrite Touma, abbot of St. Silouan Monastery in Douma, Lebanon. Many thanks to Samn! for taking the time to translate the essay. Pastoral Care and the Crisis of Power! In the See of Antioch, at the current time, there is a confrontation, a crisis of opinion, and painful consequences may follow. Are the bishops, within an eparchy that is headed by a patriarch or a metropolitan as an ecclesial administrative unit, bishops over a territory and a faithful people, or are they auxiliary bishops (asaqifa musa’idun)? The traditional position, within the Orthodox ecclesiological framework, makes the bishops within a single eparchy brothers and the primate (mallak) of the eparchy first of all the first among equals and secondarily the head of a local council, governed by principles and canons and made up of the bishops of that eparchy. This assumes that each of them oversees a territory and a people. In principle, bishops are not titular or auxiliaries, dependent upon the metropolitan or the patriarch. But, historical events came about in past eras that divided some bishops from their territories and their flocks, as happened in the Byzantine Empire after the fall of some of its regions to the Ottomans. It was hoped at the time that exiled or refugee bishops would return to their regions. However, matters became more complicated and situations worsened and such bishops found themselves permanently exiled from their flocks. Or, the dioceses which they had overseen in principle were emptied of their Orthodox people. With the passing of time, this inaugurated the custom of consecrating titular bishops who, at first, longed for military or political turnarounds that would return an Orthodox presence to their former regions. When the years went by and the winds did not blow as the boats wished, hopes changed to almost a formal etiquette, and the custom became firmly entrenched of choosing titular bishops who quickly became helpers (musa’idun) or auxiliaries (mu’awinun) to some of the actual primates of the eparchies, dependent on the patriarch. This gave birth to an unintended custom, without any ecclesiological base. However, it became accepted and enshrined in practice insofar as the ancient traditional practice among us of each bishop being the bishop of a people and a territory into decline in practice. With it, the page closed on local synods within one eparchy and it sufficed to have synods on the level of patriarchates or the equivalent. Some circles, today, hold fast to the contingent practice over ecclesiological theology because it has become widespread and followed for many years. The temporary became permanent. Others hold to intellectual principles of ecclesiological theology and hope to rectify the current historical deviation in this situation and to return dioceses to their traditional function, especially since there exists a need, here and there, for more bishops of territory and people so that we do not go too far in making the episcopate in general only an administrative, ritual function. The bishop is the pastor par excellence and must remain so in practice. Between those who seek this or that line of thought, today, there is confrontation and debate. It does not appear that it will result in a speedy understanding in the foreseeable future and it is to be feared that it will grow into an impasse and from there into something with an unpraiseworthy outcome. How to get out of this dilemma? The answer is not easy. However, if we were to put forward the reasons for this crisis, we do not find it to be simply ecclesiological or canonical in nature, but also historical, temperamental, and psychological. We have become accustomed to such with the passing of generations! It is not easy for those who have become accustomed to sole power in their eparchies and to dealing with titular bishops almost like deacons to have partners in power within the lifetime in which they work. Let us say it frankly: the problem is the problem of a power struggle! Few are prepared to let go of their prerogatives! The issue, at the base, is not ,as it is put forward, a theological issue and it is not a pastoral issue. What determines the traditional or the ecclesiological, theological or the canonical argument, at the basic level, is the holding on of each of the concerned parties to the power which they think rightly belongs to themselves and not to others. Each one brings forward this or that evidence, in reality, because it is convenient for him. If we were to hold fast to ecclesiological theology and the traditional canons, in the matter before us, then we would have to openly express only a small number of the positions we implicitly adopt or to which we consent and which are not in agreement with [Orthodox] principles. The question of the diaspora, especially North America, is today in our opinion the foundation of the current problem and what brought to light the intellectual divide which had long remained hidden. The status of any of the Orthodox churches, the See of Antioch included, is not sound there, either from an ecclesiological or a canonical standpoint. By what right do we hold on to the dependence of the Antiochian Archdiocese in North America on us? That eparchy is no longer at the stage of just being sent out. We helped it during its beginnings, but now it is mature, and more mature than us here in its theology and its learning and its organization. By what right, then, is it assumed that it should be under our care? Is it because some of its people have left us? So what? Generations and generations have grown up there for years and the people in those lands have become American. Is it because there is a sentimental heritage which ties us to them and them to us, or because there is something like nationalist feelings which hold us to them and them to us so that they must be subject to our local ecclesial structure? This has no relation in any case to ecclesiological thought nor to the ancient ecclesiological practice which has come down to us from the Apostles and saints. Thus the practical theology which we use in this matter is faulty and unacceptable if we were to be fair and correct. And what is to be said about the canonical disorders that we’re up to our ears in over there? The situation of all the Orthodox eparchies dependent on mother churches in North America is uncanonical. There is one Orthodox church in those lands whose situation is sound and canonical: the American Orthodox Church (OCA). This alone is independent and autocephalous and this is de-facto recognized by the other Orthodox eparchies. Its recognition, formal or implicit, by the eparchies depending on mother churches is clear and frank confirmation that the status of these eparchies is uncanonical and unsound. If these eparchies and mother churches on which they depend were to be logical with themselves and consistent with Orthodox ecclesiological and canonical thought, in the true sense of the word, then they would belong to the OCA or would at least enter into an understanding with it and the thorny crisis of the Orthodox presence there, theologically and canonically, would end. The simplest position and the most sound is for us to leave the Orthodox in North America to themselves and to encourage them to arrange their affairs themselves! We and the other mother churches are the ones who are complicating their affairs! Naturally, there are those who claim that the problem of the diaspora is, to a great extent, a problem of nationalist sentiment. The sentiments exist, but not to the degree that is thought. The Church in the past has dealt with nationalism– in Constantinople, in Antioch, and elsewhere– and she is able to deal with it in every time and place whenever proper ecclesial sentiment abounds. But if nationalistic notions eclipse concern of the Church, then this is a dangerous event and a serious deviation because we are no longer a church possessing one faith, but rather a group of tribes. The truth is that the mother churches hold on to their eparchies in North America because they do not want to be stripped of their prerogatives and their benefits and their power there. The issue of money plays an important role in this matter and likewise does political and ecclesial influence. None of this has any connection to the Church in the exact meaning of the word, not to her theology, nor to her canons, nor to pastoral care for her people nor to her spirituality. I will return to the subject of the bishops and I will say that the hidden cause behind the debate going on between those who hold to the concept of titular, helper bishops and the concept of local bishops over a people and a territory is, in reality, related to the passions. There is struggle for power, in the worldly sense, going on, and the arguments put forth call for each to claim his own power and leadership. But we have no power to receive, rather service to give for the Church of Christ and the People of God. For this reason, if we were to be just, then we must, first and last, to put pastoral care for the People of God before ourselves and before any other standard. The struggle for power going on today is, unfortunately, on account of this pastoral care! The single legitimate and acceptable question in this context is: what is most appropriate for the care of the Orthodox faithful here and there? For this reason it is to be hoped that the interaction of the metropolitan with the bishops within a single eparchy, wherever they may be and especially right now in North America, will be first of all with goodness, love, humility of heart, and magnanimity. The issue of the episcopate, which has long been outside the genuine ecclesiology, will not be solved by emptying it of its pastoral content and enshrining its titularity, and not by, in response, idolatrously harping on the application of cannons but rather by the metropolitan embracing the bishops as brothers, and the bishops the metropolitan. Calmly and deliberately we will become able to solve our issues in cooperation and simplicity and flexibility, relying on [Orthodox] principles, and we will raise up the People of God in truth so that God will be glorified in us. The way of dividing, subjugating with decisions from on high, and debasing is of no avail. It will only alienate and create factions and lead to schism! I say this and it is to be feared that we are in a delicate and dangerous situation. Orthodox America will not be treated in the ruinous way we are accustomed to in our lands here! If we do not leave our selfishness and our pride and build each other up with kindness and generosity and put the good of the Church and its unity and theological principles ahead of any personal consideration, whatever it may be, then worse is to come! The Patriarchate replied with this. The Archdiocese now says this. I no longer have any clear idea what this is actually about. I can tell that certain people are in disagreement about who is in charge, but I couldn’t tell you the first reason why anymore. The Holy Synod of the See of Antioch, after long discussion and deep deliberation of the Synodal decision of February 24, 2009, and with the recommendations of His Beatitude, the Patriarch, it affirms that the nature of the Episcopate is one and the same to all those who are consecrated as bishops. And that, furthermore, any diocese of the one united Archdiocese, under any circumstances, cannot be considered an independent Archdiocese. The Holy Synod of Antioch alone has the prerogative to establish Archdioceses in the See of Antioch. Bp. MARK has already weighed in on this; we will see what actually happens, if anything. It strikes me that the Synod has perhaps said as much as they can without appearing to lay the hammer down on any person in particular — which, perhaps, means they haven’t said much of anything at all, except to say that AOCNA’s self-rule status is for all intents and purposes a legal fiction with no particular effect that they are willing to recognize. Perhaps this is a first move towards folding AOCNA back in as a more normalized part of the See of Antioch? I don’t know — I guess we’ll see. How much should we read into these pictures? 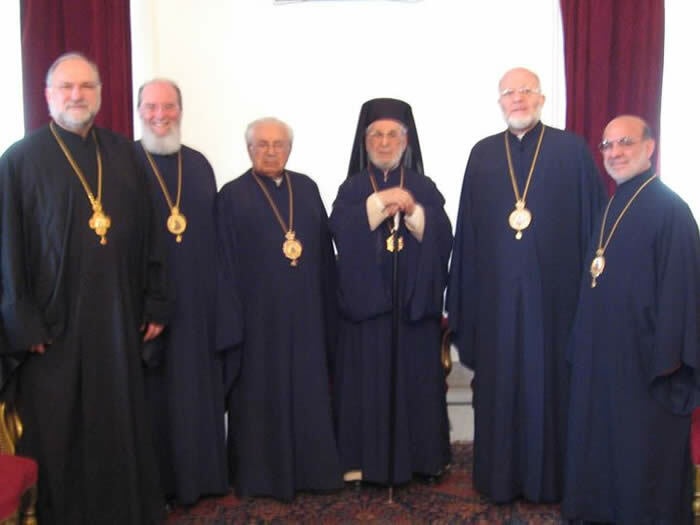 Mark Stokoe and friends report that the six bishops who were enthroned in their dioceses, minus Metropolitan PHILIP, will travel to Damascus on 1 June for meetings with Patriarch IGNATIUS IV. …the February 24th decision is not a valid decision of the Holy Synod of Antioch. Moreover, even if were, it would have no effect on our Archdiocese since it wasn’t intend to apply to our Archdiocese and if it was intended, it would not apply because it is inconsistent with, negates, and would violate the irrevocable Resolution on Self-Rule, the Archdiocese Constitution and the Archdiocese Articles of incorporation, filed with the State of New York. Unless properly amended, these documents cannot be overridden and the February 24,2009 decision is inapplicable to the Self-Ruled Archdiocese. Pursuant to the Constitution, all members of the Board of Trustees including the clergy and the hierarchs have an obligation to insure that the Archdiocese Constitution and Articles are protected. A constitution defines certain rights and privileges and obligations, these apply to the entire church population including the laity. It is incumbent upon all members to insure that these provisions are not violated even if one disagrees with them. There is an element of trust that is underlying the role of a member of the Board of Trustees (and a member of the General Assembly) whether the person is a hierarch, priest, or member of the laity. That trust is that the member will act in the best interests of the Archdiocese and follow the dictates of the spirit as well as the letter of the Constitution. If the members do not act to protect the Constitution and the self-rule as defined therein, then they will have violated that trust. The consequences, among others, will be a legitimate lack of trust by clergy and laity in the leaders of this Archdiocese. That would be tragic. Full text is at the link above, and my hat is tipped to Mark Stokoe and co.